Born ca. 1920 as one of two twins. Son of $crooge McDuck's sister Hortense McDuck and Quackmore Duck, son of Elivira "Grandma" Duck and her husband Humperdink Duck. Donald Duck thus is a descendant from both the Clan McDuck and the Coots. In Back To Long Ago! Barks shows that Donald seems to be the rebirth of the 16th century sailor Pintail Duck. In Lo$ part 11 Don Rosa shows that Donald's first meeting with Scrooge took place in 1930. When the family leaves Scrooge Donald, still a child, for a moment return to his Uncle Scrooge and gives him a kick in his back. Very little is known about Donald's life from 1930 to the early 1940's. At some point his family leaves Duckburg. If he stayed in Duckburg all the time (at Grandma Duck's farm?) or left with his family, and then returned at later point is still unknown. What we know is that at some time in the mid-1940's his three nephews Huey, Dewey and Louie moved in with him. 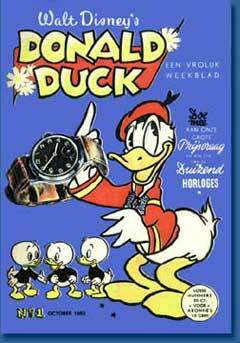 Donald Duck has trough the years tried all kinds of jobs without much success. This is though more caused by constant bad luck and stubbornness than a lack of talent. It however seems that his Uncle $crooge always has something for him, like shining his coins. In An eye for detail and more recently in The Dutchman's Secret Don Rosa shows that Donald is an expert in detecting very small details. This is why he so easily can separate HD&L from each other while for instance the people in "Plain Awful" think that the boys are totally alike each other. Once Donald built his own car (registered with the number 313) from spare parts. He has used it ever since. Donald has a rumour for being a "difficult" neighbour. His fights with his neighbour J. Jones are matter of discussions all over Duckburg. 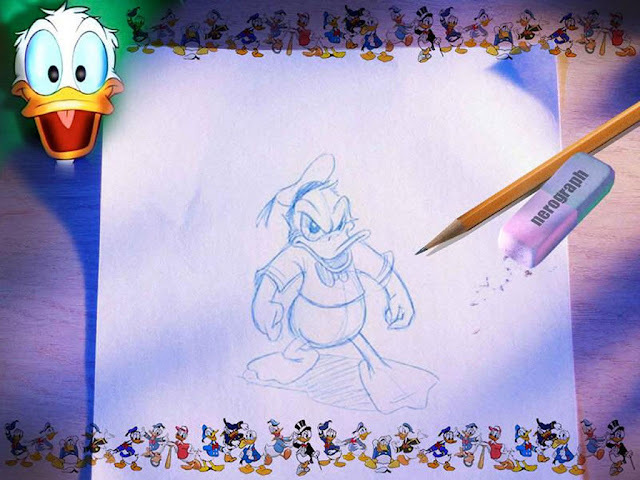 Donald is also known for fights with his own cousin Gladstone Gander over Donald's girlfriend Daisy Duck. In the private Donald raises his three nephews Huey, Dewey and Louie Duck, with great success. He's also known as a good cook with pancakes as his speciality. Address: He lives together with his three nephews Huey, Dewey and Louie in a house in Duckburg. Born: Ca. 1920 in Duckburg? 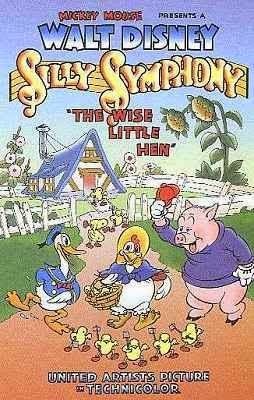 First appearance: On June 9th, 1934 in the movie "The wise little hen". Member of: "The Three Caballeros"
Occupation: Various. He often work for his uncle, $crooge. Drives: 313, a car he (according to Don Rosa) built himself from spare parts. The Duckomenta is a itinerant exhibition, whose name is a parody of the Documenta, one of the most important exhibitions of modern and contemporary art which now takes place every five years in Kassel, Germany. Duckomenta shows three dimensional sculptures that are inspired by famous works in the style of Donald Duck. 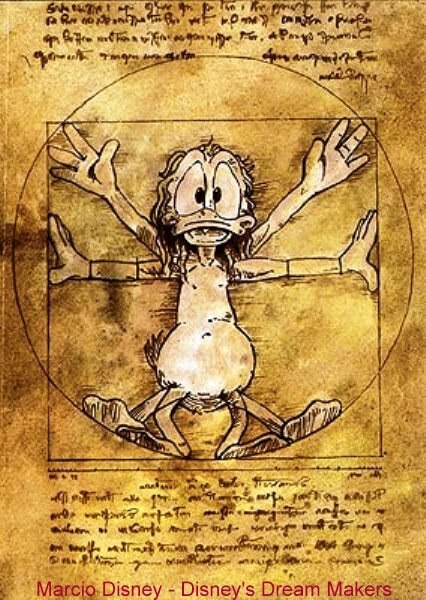 There are, for example, the Mona Lisa as a duck. It can be found art from almost all eras. The Duckomenta was visible in many places in Germany. Donald's dominant personality trait is his short temper and, in contrast, his positive look on life. Many Donald shorts start with Donald in a happy mood, without a care in the world, until something comes and spoils his day. His anger is a great cause of suffering in the duck's life, and he has on multiple occasions got in over his head and lost competitions because of it. There are times when he fights to keep his temper, and he has succeeded a few times, but he always returns to his well known, aggressive self at the end of the day. Donald's aggressive nature is a double-edged sword however, and while it at times is a hindrance and even a handicap for him, it has also helped him in times of need. When faced against a threat of some kind, Donald may get frightened and even intimidated (mostly by Pete), but rather than getting scared, he gets mad and has taken up fights with ghosts, sharks, mountain goats and even the forces of nature. And, more often than not, Donald has come out on top. However, there is seldom any malice in Donald's pranks. He is never out to hurt anyone, and if he ever goes too far in his pranks he is always very regretful. In Truant Officer Donald, for example, when he is tricked into believing he accidentally killed Huey, Dewey and Louie he shows great remorse, blaming himself and willingly takes a kick handed out by one of the “angel” nephews. That is, of course, until he realizes he has been played a sap and directly loses his temper. Donald has also been shown to be a bit of a show-off. He likes to brag, especially when he is very skilled at something. This has a tendency to get him into trouble, however, as he also tends to get in over his head. Still, Donald has proven that he is a Jack of all Trades and are, among other things, a good fisher and hockey player. Among his personality traits is his stubbornness and commitment. Even though Donald at times can be lazy, and he has stated many times that his favorite place is in the hammock, once he has committed to something he goes in for it 100%, sometimes going to extreme measures to reach his goal. Donald has a few memorable phrases that he occasionally comes out with in given situations. "What's the Big Idea!?" is a common one, which Donald usually says when stumbling across other characters in the midst of planning some sort of retaliation or prank, and sometimes when certain things don't go as planned or don't work properly. "Aw Phooey!" is another memorable saying Donald makes, usually after giving up on a particular action or event. Another popular phrase Donald says, in particular to Daisy, is, "Hiya, toots!". A running gag in the Donald Duck comics is about his physical condition. Usually, some character close to Donald believes that because of his laziness, Donald needs to do some exercise, which annoys Donald. But, in spite of his apparent lazy condition, Donald proves that he is physically strong, as evidenced in one of his shorts, Sea Scouts, where Donald travels in a boat with his nephews, but a shark attacks the boat and Donald, after several misadventures, finally defeats the shark with a single punch. Through out his career, Donald has shown that he's jealous of Mickey and wants his job as Disney's greatest star. In the early Disney shorts, Mickey and Donald were partners, but by the time The Mickey Mouse Club aired on television, it was shown that Donald always wanted the spotlight. One animated short that rivaled the famous Mickey Mouse March song was showing Huey, Dewey, and Louie as Boy Scouts and Donald as their Scoutmaster at a cliff near a remote forest and Donald leads them in a song mirroring the Mouseketeers theme "D-O-N-A-L-D D-U-C-K-! Donald Duck!" The rivalry would cause Donald some problems, in a 1988 TV special, where Mickey is cursed by a sorcerer to become unnoticed, the world believes Mickey to be kidnapped. Donald Duck is then arrested for the kidnapping of Mickey, as he is considered to be the chief suspect, due to their rivalry. However, Donald did later get the charges dismissed, due to lack of evidence. Walt Disney, in his Wonderful World of Color, would sometimes make reference to the rivalry. Walt, one time, had presented Donald with a gigantic birthday cake and commented how it was "even bigger than Mickey's", which pleased Donald. The clip was rebroadcast in November 1984 during a TV special honoring Donald's 50th birthday. The rivalry between Mickey and Donald has also been shown in Disney's House of Mouse. It was shown that Donald wanted to be the Club's founder and wanted to change the name from House of Mouse to House of Duck. However, in later episodes, Donald accepted that Mickey was the founder and worked with Mickey as a partner to make the club profitable. Mickey Mouse has failed to realize how much Donald does not like him at times, and always counts him as one of his best friends. Despite the rivalry, Donald seems to be an honest friend of Mickey's, and will be faithful to him in tough situations, such as working with Mickey and Goofy as a team akin to The Three Musketeers. In the Kingdom Hearts games, Donald is quite loyal to Mickey, even briefly leaving Sora to follow King Mickey's orders. The rivalry between Mickey and Donald is not unlike that of Warner Bros. characters Bugs Bunny and Daffy Duck, and many animation fans have commented on the parallels present among the four characters, the main difference being that Bugs actually realises that Daffy doesn't always like him, and uses this fact to play tricks on the duck. Although Donald's military service has most been recognized as him in the US Army from his wartime cartoons (and to a lesser extent having Donald in the US Navy from Duck Tales), Walt Disney had authorized Donald to be used as a mascot for the US Coast Guard. The Coast Guard image shows a fierce-looking Donald Duck dressed in a pirate's outfit, appearing vigilant against any potential threats to the coastal regions in the United States. This image is still often used on many Coast Guard bases and Coast Guard cutters today. In Sweden, a comic book artist named Charlie Christensen got into a legal dispute with Disney when his creation Arne Anka looked similar to Donald Duck (albeit Arne is a pessimistic drunkard). However Charlie made a mockery of the legal action, and staged a fake death for his character, who then had plastic surgery performed and reappeared as Arne X with a more crow-like beak. He later purchased a strap-on duck beak from a novelty gift shop, pointing out that "If Disney are planning to give me any legal action all I have to do is remove my fake beak." 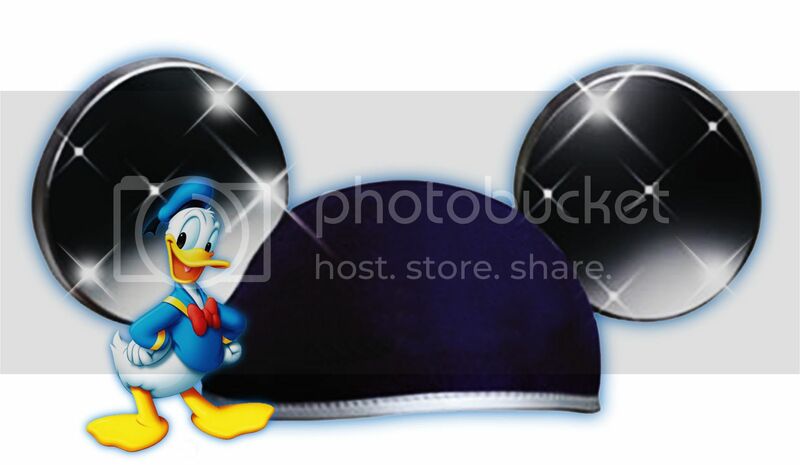 Donald's fame has led Disney to license the character for a number of video games, such as the Kingdom Hearts series, where Donald is the court magician of Disney Castle. He accompanies Goofy and a young boy named Sora on a quest to find King Mickey Mouse, defeat the Heartless and destroy the evil Organization XIII. He is voiced by Tony Anselmo in the English version and Kōichi Yamadera in the Japanese version.